Last week we were pleasantly surprised when our Bluum Baby Box for May arrived. We were impressed with the contents of the box. 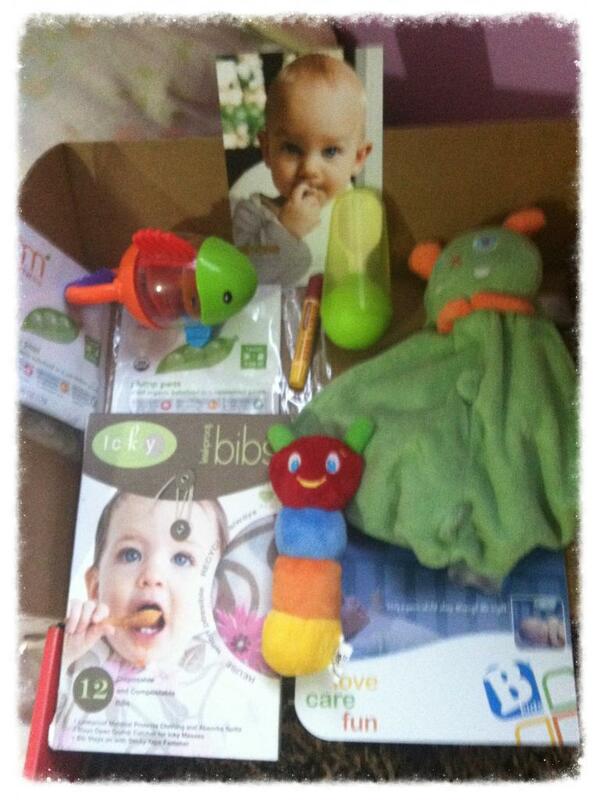 For those of you who don't know what Bluum box is, it's a monthly subscription box for your little one. You sign up and receive and invite, ( I got mine within a couple of days. ) you fill in your profile with information about your child's name and age. Each month you will get a box which has age appropriate items. 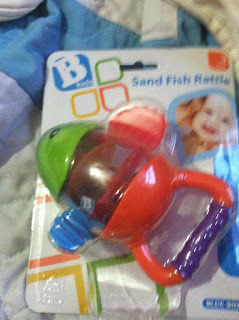 They sometimes include items for mommies too. I believe it is usually around $21 a month, I found a coupon online though and we only paid $16.95 . Also you earn points for your reviews and for referring friends, once you hit 500 points, you get a FREE Bluum box. ( each person who subscribes with your link, gets you 500 points= free box ). So far we think that this baby box is completely worth it. Let's get to it, sorry for the pic heavy post, and I apologize for the quality. Box Theme this month is : Solids. I love the idea of the Nurturme Plump Peas, we got two packets of this. 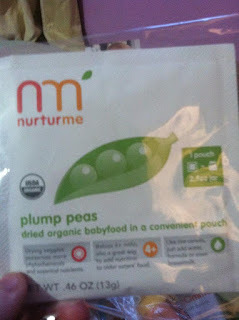 We have started our little one on baby food, and she's in love with peas and carrots.I like the fact that these are mix as much or as little as you need. With jarred baby food, it says to only keep for up to 3 days in the fridge once opened. I don't have to worry about that with these. 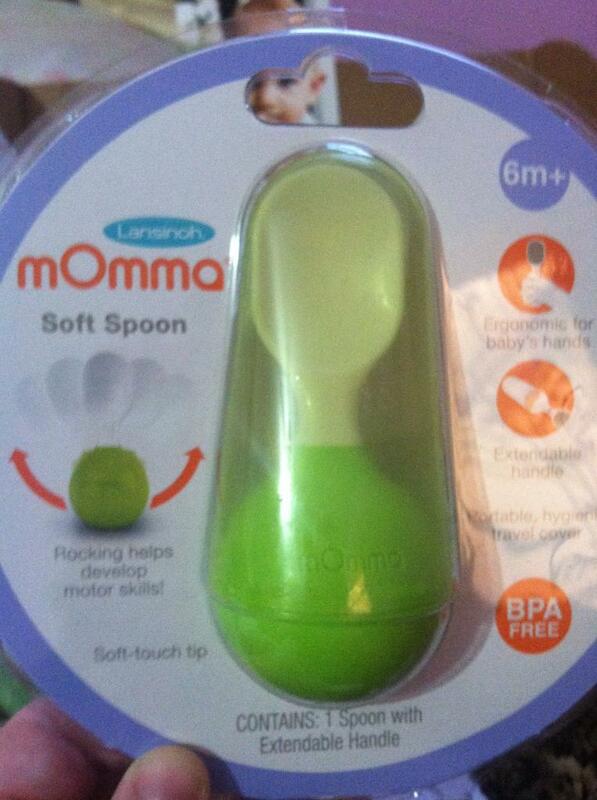 The mOmma Soft Spoon, we love as well. It's soft and dishwasher safe. You can attach the lid to the bottom and it becomes a handle and makes the spoon handle longer. It's easy for our daughter to grip and doesn't slip out of her hand like other baby spoons we've been using. I would definitely buy this spoon. The only small issue I have with this spoon is that the actual spoon part is still a bit too big for our daughter's mouth, but she is only 5 months so I'm sure as she gets older it will be easier for her to eat off this spoon. 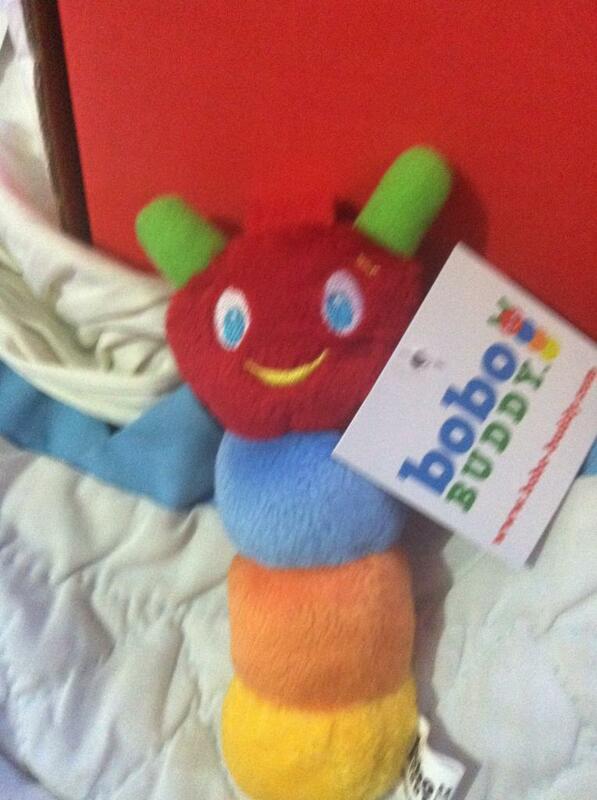 Next was this Bobo Buddy. It's a pacifier holder. I like it, but we really don't use pacifiers that much with our daughter, ( not enough to have one attached to her clothing anyways ). I do like how soft the bobo buddy is though, and it's big enough that our daughter has been using it as a toy. Our daughter LOVES the Sandfish Rattle. The bright colours really catch her attention and same as the sounds when you twist the tail fin. We would definitely purchase this one for her in the future or for future children. The Angel Dear Monster Blankie we absolutely love! 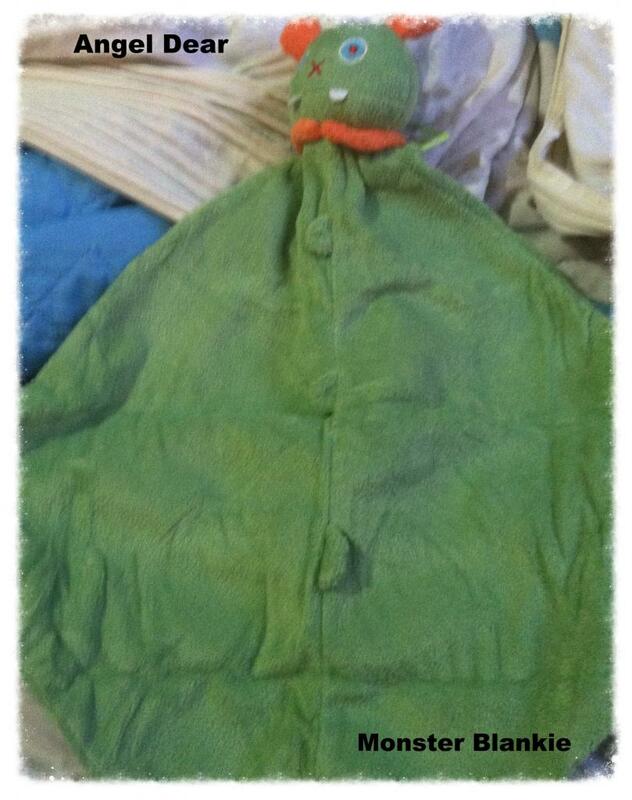 It's soft and machine washable. It's a good size and they also included a 20% off coupon in the box for the Angel Dear website. I went onto their site and they have teething blankies. The prices aren't too bad either. I'm planning on using the coupon on one of the teething buddies ( probably the giraffe one for $15.00 ) She loves the giraffe pattern on things, and instantly attaches to them. 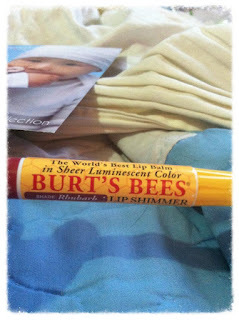 The last product that was in the Bluum Box was the Burt's Bees Lip Shimmer, in the colour Rhubarb. 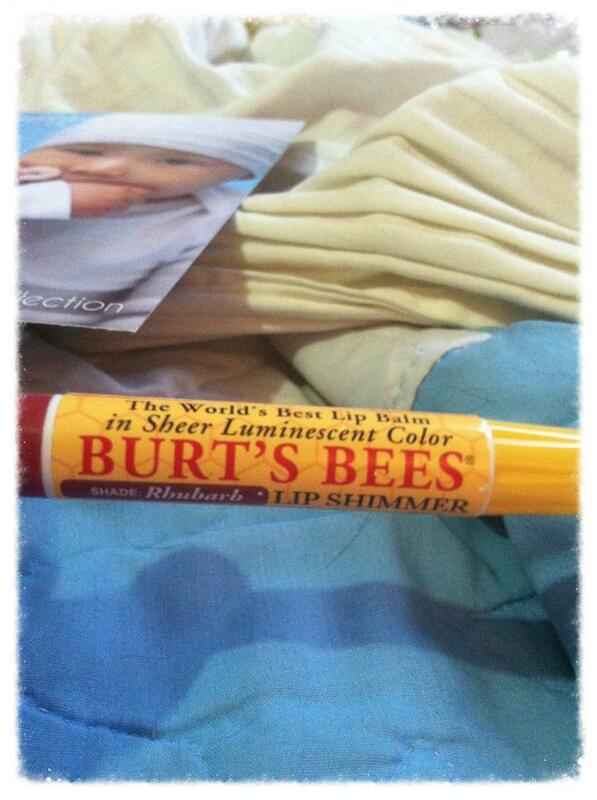 I love Burt's Bees products, but don't always buy them because they can be pricey. However after receiving this I may have to go out and purchase some anyways. I love the minty fresh smell of the Lip Shimmer and the colour is just enough to look like a tint but isn't overpowering. Overall, the Bluum box impressed us. This was our first box subscription so we weren't sure what to expect, but I'm happy to say that we are very satisfied with the products that came in the box. Our little one loves them and so do we. Also all the products are ones that we will actually use. Here is my link if anyone is interested in signing up for the Bluum box, http://bluum.me/10yJQu7 .